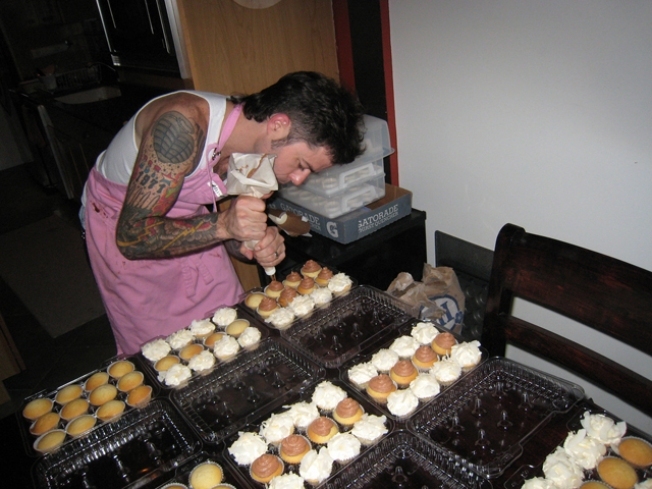 The Mission Minis chef hard at work. First the health department iced Mission Minis and now the Internets is reeking havoc for the small San Francisco bakery. Mission Minis recently ran a promotion to entice customers to its shop on 3168 22nd St. that almost put the icing on the bakery. Three Mission Mini employees threatened to quit after a promotion with online coupon site Groupon received a little more attention than the bakery can handle, according to Mission Local. On March 30, Groupon emailed thousands of Bay Area residents a coupon to purchase two-dozen miniature cupcakes from Mission Minis for $11. The response to the 50 percent discount was too much for the store to keep up with. In one day, more than 3,000 people took advantage of the deal and forced Mission Mini's staff to go shopping twice a day for supplies. The response forced the bakery to put up a special disclaimer on its website for its hoards of Groupon customers. "We're a small local business and we're pumped (but swamped) with your orders :)," Mission Minis wrote. "Please give us 48 hours notice for your order and be aware that weekends fill up fast." Don't forget to shoot them an email letting them know you placed an order.